I recently read this little sign thing that made me laugh. “I don’t like morning people … or mornings … or people.” That’s not me but we all know someone that seems to live that way, don’t we? It isn’t a good idea to be the grouchy one that everyone “unfollows” on facebook because you continually whine. It isn’t a good idea to be the one everyone leaves the room when you come in because you only say negative things. And you’re not going to have many friends to go out to eat with if you don’t get rid of our sour attitude. Whatever is making you grouchy is either something you need to accept or fix. And I promise what you’re going through, there are people with worse problems that aren’t taking the world and their friends and family down with them. Get a grip. Get over yourself and just get things done. Bad days happen. Bad weeks happen. Bad years happen (I remember when we lost both crops in 1980 and had three babies … not a stellar year). But that doesn’t need to make you want to make everyone else unhappy with you. Act happy and pretty soon you’ll start feeling happier. Speaking of families, I had a family reunion in Colorado in June. A clan gathering. With 36 first cousins, many of whom are very prolific (Johnny wins that award with his 11 children), the gathering usually has a large number of people there. And many of them are large. Or at least tall. Let me just say that we can certainly fill up a room better than most families. Crazy is a relative term in my family. Our family puts the FUN in dys-FUN-ctional. Yeah, I bet you wish you had been there. It’s a hoot. We all tend to think we’re pretty funny. And we do have storytelling time. About each other. There’s nothing like it. Fun times. It isn’t easy being a Grantham. We have certain expectations of one another. But then it’s easy because we accept one another despite the fact that we cannot live up to all expectations. It’s a nice place to be. A few other nice places to be include the Children’s Health Fair on July 17 at the Activity Center from 3 to 6 pm; the Wit and Wisdom Evening catered by Virgil Gibson on July 21 at 5:30 pm at Pioneer Hall (but your $20 tickets now because only 36 are being sold); and don’t miss the Healthy Moment at Play Like a Girl, 116 E 6th Street, from 5:00 – 6:00 pm and you have the chance to win $100 in Main Bucks if you attend. And the PBR, professional bull riding, is July 26th! That is going to be a great event. Be sure to be there. Azuma: An African Celebration is Aug. 10 and going to be another fantastic afternoon. 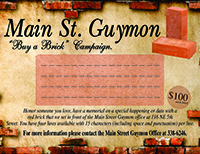 And BE AWARE that the Guymon Shopping Tournament is just around the corner and someone will earn the right to take home $1,500!!!!!! !